German police have used batons, pepper spray and water cannon against far right extremists, who hurled rocks, bottles and firecrackers at them. At least 13 German riot police have been injured in clashes with far-right hooligans rallying against Islamist extremism in the western city of Cologne. Six people were arrested and one of the police officers was seriously hurt. Police used batons, pepper spray and water cannon against the protesters, who hurled rocks, bottles and firecrackers at them. 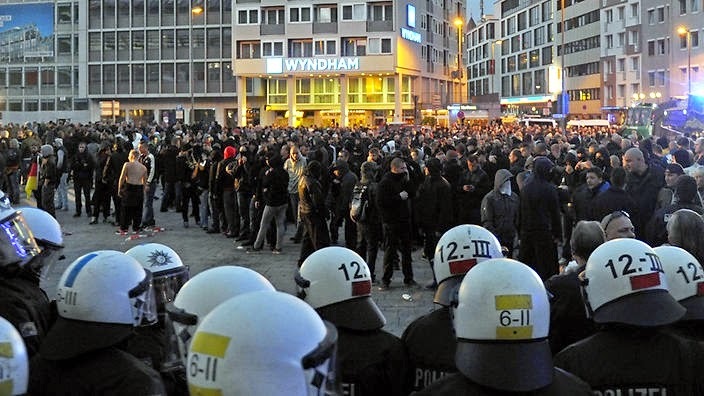 Around 2500 hardline football fans and far right extremists from across Germany had massed under the banner "Hooligans against Salafists", drawing some 500 leftist and anti-fascist counter protesters. Tensions escalated and right-wing protesters repeatedly yelled "Foreigners out!". Earlier this month, Kurds in Germany clashed with radical Muslims in the northern city of Hamburg and elsewhere, in street protests fuelled by the conflict involving the jihadist group Islamic State in northern Iraq and Syria.